One click. Dozens of cryptos. Zero service fees. Get $5 in bonus bundles for your first investment! Each bundle is carefully crafted by experts to match your investment needs and preferences, whether its your risk profile or your beliefs. CoinBundle is built to match the needs of investors at all levels of expertise. Invest and grow your savings up to 20% faster by avoiding service fees. Only pay 3.5% transaction fees on credit/debit card deposits and zero fees on crypto deposits. Our team of crypto and finance experts analyzes the market for you to carefully construct bundles with the right coins that match your investment preferences. Funds are stored securely and insured against theft with Kingdom Trust, the global leader in alternative asset custody. Why should I buy bundles instead of individual tokens? 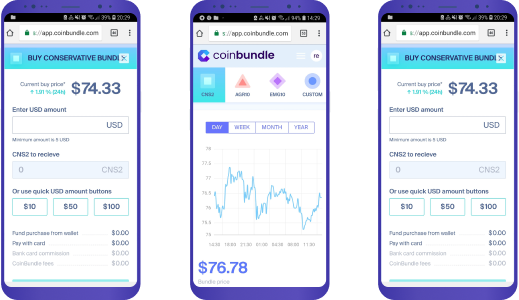 How can I buy cryptocurrencies on CoinBundle? How will you store user's assets securely? How is the team qualified to build this product? 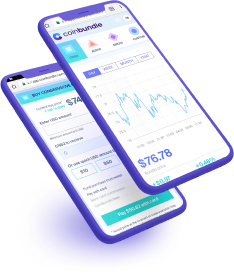 CoinBundle is the easiest way to build your investment portfolio by buying bundles of cryptocurrencies with just one click. New users to crypto-currency do not have the experience to predict which tokens will do well, and given the nascency of the industry even experienced investors do not have that insight. We allow you to build a diversified portfolio of currencies based on your risk tolerance or personal preferences with just one click. Connect your credit card or bank account information, answer a few questions about your profile, and select which bundle you want to buy. It only takes few minutes to start. We are partnering with a custody provider to safely secure our assets. CoinBundle provides best in class security in partnership with Kingdom Holdings, so that you can invest your assets with peace of mind. Learn more here. Our core team members have over 50 years of experience working with non-traditional financial instruments and complex regulatory environments. We are backed by the top investors in Silicon Valley including Initialized Capital, Tuesday Capital and YCombinator.